The term ‘hydrodynamic separators’ refers to a group of stormwater management technologies that treats stormwater primarily by using gravity to remove settleable particles and phase separation to remove buoyant materials (free oils and grease) from the water matrix. The technology does not attenuate flows because units have minimal detention storage. As a result, hydrodynamic separators are considered appropriate when used in combination with water quantity control technologies, or as a stand alone at sites where water quantity control is not required. Hydrodynamic Separators are usually flow through structures installed underground as part of a storm drainage system. They are also commonly referred to as oil and grit separators (OGS). In addition to gravity and phase separation, OGS often include other functions to provide treatment. Some units are designed with only one separation technique, while others use a combination of separation techniques. Common design features include by-pass, swirl action, screening action, and coalescence action. The by-pass feature allows only low flows to be treated while high flows by-pass the treatment chamber. This prevents the re-suspension of particles in the water matrix which may be brought about during turbulence associated with high inflows. 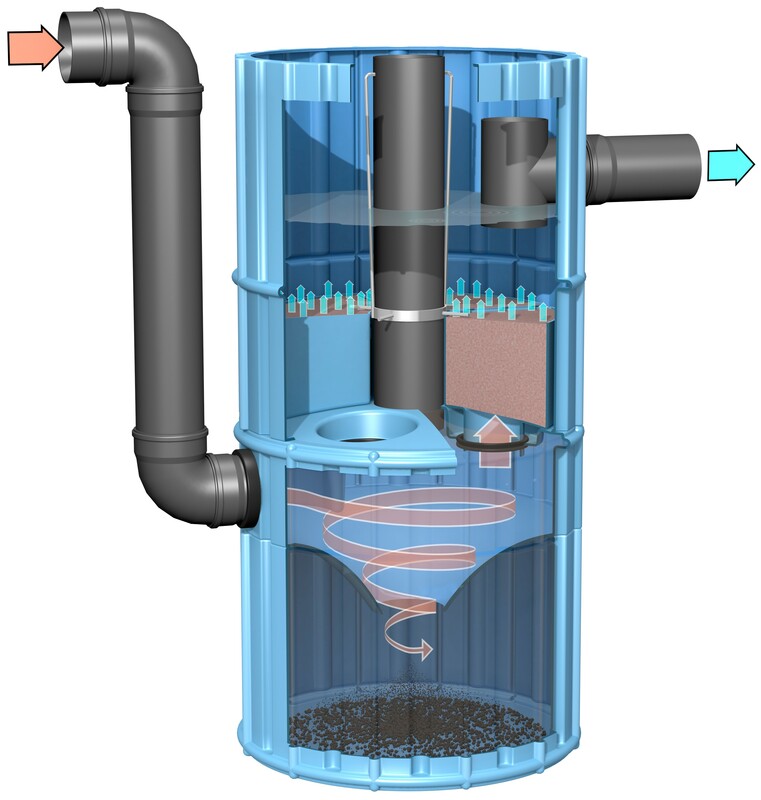 The swirl action feature allows stormwater to enter the unit on a tangent to the chamber which promotes a swirling motion. Sediments are removed by gravity and deposited at the bottom of the chamber. Separators with screening action employ specially designed screens to remove solids from stormwater. Flow direction is tangential to the screen surface and the screen allows stormwater to pass through while solids are retained on the inside. Further settling of solids is achieved as flow velocities are reduced as water passes through the screen. Coalescence action units consist of a series of parallel plates usually positioned at an angle to the direction of flow. Small oil droplets suspended in the stormwater matrix cohere to the surface of the plates, and as oil accumulates, large drops eventually break away from the plate surface and float to the water surface where they are trapped. Hydrodynamic separators require frequent maintenance and, therefore, can only be expected to function effectively in conjunction with an effective and enforceable maintenance plan.